Chikuni is a village in the Southern Province of Zambia, 30KM from the nearest town, Monze. It is a place where Fr. Moreau s.j. started Chikuni Mission in 1905. 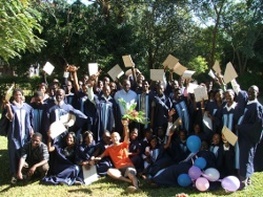 Within years, the mission was running primary schools, a secondary school, a hospital and a teachers training college. Due to the large area covered by Chikuni Parish, it is structured into outstations and Small Christian Communities (SCC). At present there are 21 outstations and nearly 170 SCC in the Parish. Chikuni Parish Runs many projects under the auspices of the Parish Development Committee (PDC). These projects deal with different issues within the communities around the parish. In an effort to reduce illiteracy levels, Chikuni Parish has partnered with government through the Education Broadcasting Services to provide an education to vulnerable children who can not attend formal schools. It does this through Interactive Radio Instructions, IRI, commonly called ‘Taonga market”. Those who attend Taonga Market are usually children that are unable to walk the often long distances to schools (sometimes a 50-km round trip!) or become farmers despite their young age. This project started in 2000 with just two centres. Now they run twenty-two centres. The lessons are broadcast on Chikuni Community Radio station from Monday to Friday. “Radio Schools” have been set up that use wind up radios and are run by local volunteer teachers commonly called mentors. There are currently 70 mentors throughout the various centres centres. The mentors help the children to follow the educational programmes that are broadcast and help them with exercises and drills before and after the programme. The mentors have worked hard with the coordinator, Mrs B.M Kamoto and supervisors from the parish to see this project through. The children who attend Taonga Market have achieved some excellent results with many getting top places in the National School Tests. With a very simple set up, the programme offers children a full education up to grade seven, with 2 500 pupils. These learners are provided with books, pencils and pens among other materials. Through the generous help of outside organisations we are also able to provide the children who attend with lunch each day. With the help of a German group called Kindernothilfe we have drilled boreholes in five centres to pilate an Agro forestry project to impart agricultural knowledge to the learners. They hope to drill boreholes in all the centres. Ten mentors have been trained in Sustainable Agriculture and organic vegetable gardening and they hope to train them more in agro-forestry. They have also managed to build a 1 by 2 classrom block with an office at Cheelo Taonga centre, 27 kilometres from Chikuni centre. They hope to build in other centres too if they get funds from well wishers.We can therefore proudly say, a lot of people, young and old have learnt to read and write through this project. CLICK HERE to like us on Facebook and CLICK HERE to watch Videos on our YouTube Channel. 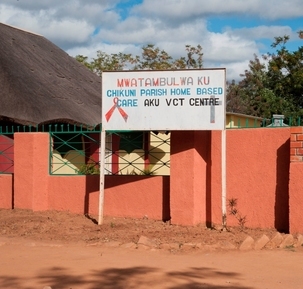 Like the rest of sub-Saharan Africa, Zambia is in a seemingly never ending struggle with HIV/AIDS and the Chikuni HBC is central to the fight against the silent disease in this area of rural Zambia. Our vision is to improve the quality of care for the terminally ill and prevent the diseases spread by sensitizing our community especially on HIV & AIDS, but our work includes much more than that. We are not only aiming at improving the patient's health, but also his education, status and food security, while communities and families are as well benefiting. Another of HBCs main purposes is to improve people's access to information and education in order to help them protect themselves against the disease and sensitize the community about HIV/AIDS related issues. The result of 15 years of home based care work is a community where people can discuss openly about the silent disease and stigma is significantly reduced. Currently the centre offers a variety of services to more than 700 patients living in 180 villages within its 5000 sq km catchment area that covers 3 districts; Monze, Gwembe and Choma. Almost daily there are new people tested HIV positive and each one is offered to become clients of Chikuni HBC and benefit from the service we provide. The Chikuni Orphans Education Project was initiated by Chikuni Parish priest, Fr Tadeusz Swiderski in the year 2000. It was formed out of the many problems that the orphans faced. The parish discovered that most of the orphans were underprivileged in the sense that they never received the necessary education support. This was because their guardians were either too old or too poor to support them educationally, feed them and clothe them. The idea of the project was floated to the people in the parish and they all agreed education would be the best thing for them as most of them had dropped out of school due to lack of sponsorship. They then chose an executive which is composed of nine members with the parish priest being the overseer. Chikuni Parish caters for a wide area. There are twenty-one centres that make up Chikuni Parish. In each centre, there are Small Christian Communities that consists of several villages meeting to share the word of God. It is from these Small Christian Communities that orphans are identified and their names submitted to the orphans education project. A lot of orphans need help, but this project is only able to support 1,500 orphans at the moment. The project is run by the Catholic Church but also caters for children who are not Catholic. The orphans are given school fees, uniforms, clothes, food and other essentials. These are orphans in school from Grades 1-12 and a few at college. 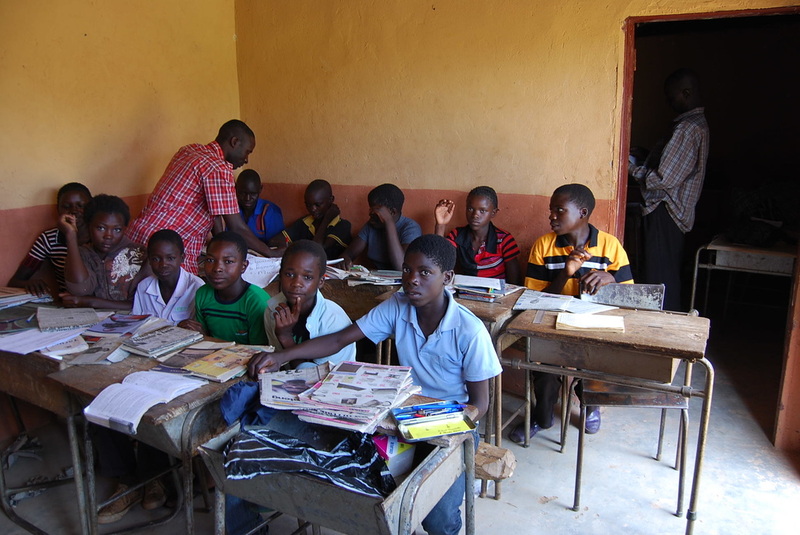 The Chikuni Orphans Education Project is supporting children in 18 schools within the parish. Orphans in primary school are given blankets and other essentials instead of school fees because the government declared free education in primary schools. All of this can only be achieved with the help of non-governmental organisations (NGOs) in Italy and others in Poland. Since the projects inception, these NGO's have been interminable in their support and funding of the project. These donors visit Chikuni from time to time to see how the project is being run. The orphans committee also does a lot of things to ensure the project is a success. They organise projects for fundraising, visit centres and Small Christian Communities, organise orphans’ day, and hold workshops, among others. They visit the centres to follow up on the money given out and to see if the projects are running smoothly. Through their visits and meetings, the orphans Education Project became aware of some orphans who were being mistreated by their guardians. The Committee decided to have an ‘Orphans Day’. This is a day set aside where orphans, guardians, representatives and anyone from the villages come to see orphans play, sing and share life experiences. The orphans are able to talk about their problems and this has helped immensely because their guardians hear for themselves what happens to the children when they are mistreated. This has brought peace and happiness to alot of the orphans. The church councils and Small Christian Communities are working hand in hand with the orphans committee to develop the life of orphans. The believe that there is nothing more worthwhile than to sacrifice and work for these children as it is for the greater Glory of God. In 2010 a need was identified to provide the people of Chikuni with access to new technology such as computers and the internet. At that time only people in institutions such as the Society of Jesus or people who worked for companies with existing computer networks, had access to computers and to the Internet. Young people who were newly graduating from high school, young adults waiting for job placements, nurses, teachers, retired people and all sorts of other people who had an interest in computers had no viable route to gain access and learn how to use a computer. In this modern online age, Chikuni Parish wanted it’s young people to be familiar with computers before they reached third level education just as they are in the Western world. So in the last quarter of 2010, with great support from the Rotary Club of Milan through the Italian NGO Arché, the parish was able to set up a computer laboratory with 10 brand new computers. On top of this, the laboratory was connected to a brand new network being installed throughout Chikuni that will allow all computers on this network to access the Internet when the final phase of the project is implemented. Along with the computers, a volunteer from Arché also came to help set up the laboratory and to run the first set of computer courses while a permanent local teacher was being recruited. The course introducing people to computers and teaches them the basics of what a computer is as well as how to create documents, spreadsheets and presentations. The course runs five days a week and lasts six weeks with a final examination at the end. The courses have proven very popular amongst all age ranges, owing in large part to the flexibility of the course times. Depending on demand, the laboratory is able to cater for up to four sessions per day, one early morning, one in the late morning, one in the afternoon and one in the evening. The daytime courses are aimed at young and retired people while the evening course is aimed at those who have to work during the day such as radio staff, nurses or teachers. While this course has a low enrolment fee, it is still sufficient to cover the running costs of the laboratory. The fee was set taking into consideration many different factors but the two most important where to create a low barrier of entry so that almost anyone who wanted to do the course could afford to do it and that the parish wanted to only cover the running costs. Because the courses have proven so popular, it was requested that there be a big graduation event twice a year for the participants of the course. This has also proven very popular as a way to get together with old class mates, to meet the teacher and just a chance to have some fun. The net step for the laboratory is to expand it and open an internet café so that people, who now know how to use a computer, can access information available online, can further improve upon what they learnt during the course and can prepare documents such as CVs etc.